Have you ever marvelled at how much you can learn about something just by reading what people are saying on Facebook? The other evening, I saw part of “Asperger’s and Me: Chris Packham”, in which Chris Packham, TV presenter and nature photographer, discloses his Asperger’s diagnosis and talks about how it affects him. Having not watched all of it, I can’t do a detailed analysis of the whole thing. Instead, what I thought I’d do is explore a couple of issues brought up by people discussing it on Facebook, and also share my thoughts on what I did see. I’d never heard of Chris Packham until now, and this is thought to be the first time he has talked about having Asperger’s. In response, some people have said that this film has shown him in a whole new light, and that they had simply thought of him as socially awkward and hard to relate to. This may make them sound bad to you, and is definitely part of why having Asperger’s is lonely. But no-one’s a mind reader, and this is why disclosure is important. It’s hard – I couldn’t face telling anyone for years – but people need to learn, and many are willing to try. One part I did catch was where he visited a school and a clinic in the US, where Asperger’s and other forms of autism were seen as something to be cured. I’ve said what I think about healing autism, and honestly, this bit disturbed me. The clinic tried to treat patients with shock therapy – electric shocks into the brain that were supposed to realign certain parts of it. The school was chaotic, noisy, and disorganised. The headteacher likened autism to cancer. Worst of all, frightened, screaming children were physically punished for showing any autistic behaviour. Another issue that came up was: do people “suffer” from Asperger’s? Or is that offensive? Well, it’s not an illness, I’m very firm about that. You don’t catch it, develop it, treat it, stop having it, die of it, or pass it around. With a loving support system and good education, you develop and grow, but you don’t get off that spectrum! So in that way, you don’t “suffer” from Asperger’s. What you suffer from is being autistic in a world made for neurotypical people, for whom body language and facial expressions make up the native language. You suffer from prejudice, and living with the knowledge that some people want people like you “bred out”. You suffer from people not warming to you because you don’t know how to make friends. That’s a lot of suffering, for a condition that doesn’t cause suffering! Do I agree that people “suffer” from AS? You don’t suffer “from” it, but I can’t deny it can cause you to suffer. What do you think? Cats are aloof, they say. Cats are dignified, they say. So tell me, any of you, has anyone ever seen a cat quite like this one? If you know me – or at least my blog – very well, then you will have met Bouncer. Pictured above is his brother. What prompted me to suddenly give Tango a bit of screen time was something actually quite sobering. Earlier this week, with little warning, he took ill rather dramatically. Having vomited copiously in at least two rooms, my mum and sister found him in a state of collapse. While the picture above indicates, not entirely incorrectly, that collapse is a normal state for him, he was rushed to the vets, put on a drip and kept in overnight. Meanwhile, we were told he probably had something wrong with his heart. I inwardly accepted that this blog post was going to be something between an obituary and a eulogy. 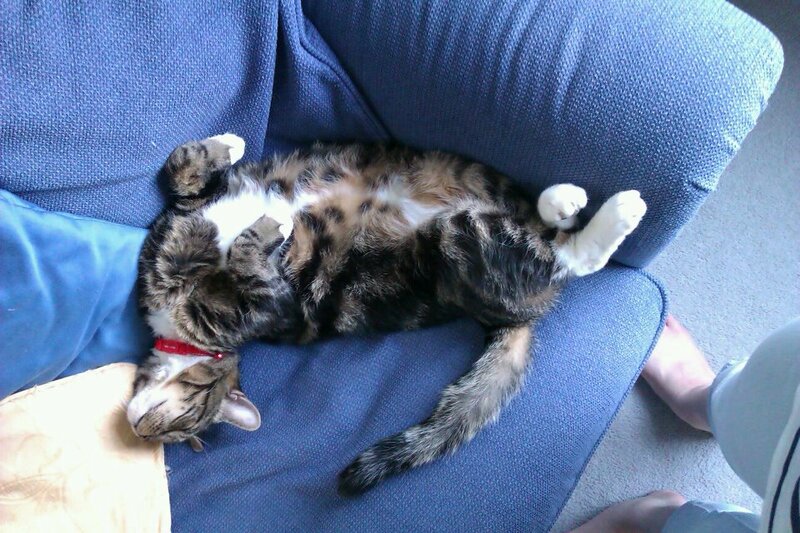 To get a diagnosis, he had to be taken to a feline heart specialist in Derbyshire. Two car journeys, a heart scan, and a three-digit-long fee later, it turned out there was nothing wrong with his heart. So much for that. Tango’s defining trait has always been his docility. At least one of the vets described him as “such a dude”, and at no point during his x-ray at the vets, or heart scan in Derbyshire, did anyone feel the need to anaesthetise him. For him, there seems to be a very fine line between illness-induced lethargy and normal behaviour. He barely woke when, as an animal care student in my teens, I had to give him a physical health-check for an assignment. I think he was a bit disconcerted when I started flexing his legs, but I was finished before he even got around to reacting. We went on holiday a few years ago and left the cats in the care of one of my stepbrothers who, at one point, rang Mum and John, because he was worried about Tango. Needless to say, we had to reassure him that no, nothing was wrong with Tango, and yes, lying with his legs in the air and rarely waking up is perfectly healthy behaviour. For him. For such a placid cat, he is a bit funny about late-neutered males. He hated Basil, my late grandmother’s cat, on sight. While Basil bullied Bouncer relentlessly, Tango pursued Basil with a Mr Hyde persona if he so much as looked at him; it was as if, for every blow Basil gave Bouncer, Tango would dole out two. When George kept turning up in our garden as a stray, it looked like he was in for similar treatment. Now, give or take the occasional fur-flying squabble where collars go pinging off, they seem to have come to a truce. In fact, George is fascinated by him, and doesn’t seem to understand that, while bottom sniffing has its perks, Tango doesn’t share his enthusiasm for it. Now he and Bouncer are 13 1/2, having joined our household when they could still fit in one hand. Tango may be the soppiest cat I’ve ever met, but I’ll say this for him: in his own way, he’s stoical. He may be inclined to roll off beds in his sleep, he may panic if your keys rattle too loudly. But, as the brother who drew the short straw healthwise, he continues to be his usual trusting self throughout eczema medicine, eyedrops, and at one point a cone collar, being forced upon him. And while we’ve all been losing sleep over the thought of losing him, he has dealt with the ordeal with his usual unconditional trust and affection. Couldn’t we all learn from that? People say there’s good change and bad change. A while back, I expanded on this. Some things should change, some things will inevitably change, some things shouldn’t change, and some things will never change. Sound about right? This is definitely true in a broader sense, but at the time, I was actually thinking about people as individuals. People change all the time. Some refuse to budge when push comes to shove. Others make a conscious effort, and there’s a very fine line between putting on a show just to impress, and changing so that you grow and improve. You’ve probably heard that people on the autistic spectrum – like me – struggle with “inflexible thinking”. In response, I’d say I’m a flexible thinker, and a less flexible doer. I’ve willingly dealt with, and sometimes even welcomed, something new. I don’t have a meltdown if one week has a slightly different schedule to most weeks. I’m wary of getting so stuck in a particular thought pattern that it’s impossible to see outside it. See? I can handle change. But my parents would point out that, in spite of all that, I still find it hard. And actually, they have a point. If things are going to be different, I like to know about it in advance and prepare as much as necessary. Right now, post-internship, I’m at a bit of a crossroad. This past fortnight has had some rather unexpected ups and downs. On top of that, I’ve had one-to-one meetings with new people, job applications and an interview, and a new editorial role on De Montfort Uni‘s magazine, the Demon. I can’t deny, it’s all very unsettling. I think the reason people like me struggle with change is because there is a lot we don’t understand that comes easily for others, and so we feel a strong need for our environment to make sense. When there’s a lot going on, and I’m always asking what’s happening, when, where, etc. it’s like I can’t see all that, and am feeling my way in order to get a picture of my current situation. I suppose the main thing to understand about change is that it’s unavoidable. Also it’s hard to pinpoint any specific way of handling it when every situation is different. I guess if something new is coming up and you know it, prepare and learn, even if it means asking the same things more than once. New things that you know nothing about are harder, but they’re not always bad. When things do go wrong, be aware of your needs and emotional reactions, and think about how you are going to get through. As for good change, it might help to think about why it’s happening, or what good may result, and if you don’t know, even if it feels difficult, that’s ok.